Biogeochemical cycles in the Ocean. Restoring and managing World’s estuaries. The workshop took place on the 7-9th of November 2017 in Santa Marta (Colombia). 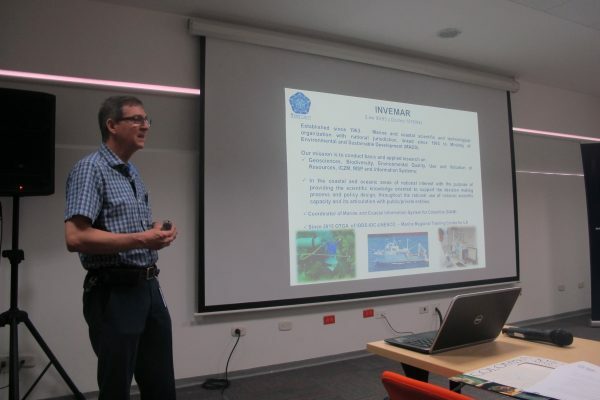 The organizing partner for this event was be INVEMAR, a reference centre for marine research in the Caribbean area. INVEMAR is charged with conducting basic and applied research on the natural renewable resources and the environment of coastal and oceanic ecosystems. Besides, INVEMAR is also a Research Infrastructure that manages the Marine Environment Information System. Francisco Bonet (University of Granada. Spain), the coordinator of COOP+ presented an overview of the project. He also introduced the main objectives of the workshop, paying special attention both to the tangibles ones (documents, working groups, etc.) to the intangibles (trust, cooperation, etc.). Francisco Armando Arias Isaza, director of INVEMAR presented the institute and welcomed the attendees. 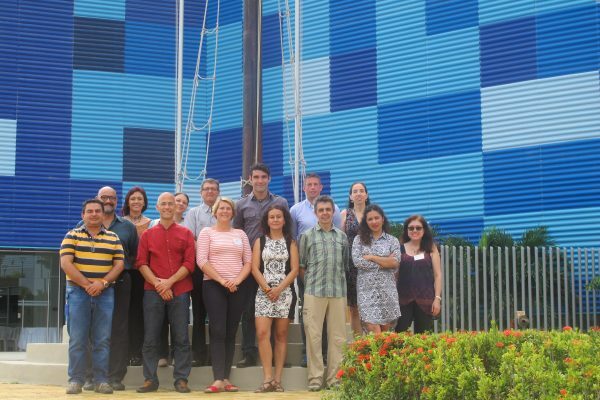 Marcela Sánchez presented CEMarin (Corporation Center of Excellence in Marine Sciences). Diarmuid O’Conchubhair presented the Irish Marine Institute. Valeria Pizarro presented EcoMares Foundation. A document on the current needs and status from the point of view of Research Infrastructures on the knowledge and actions regarding identified “Marine Global Challenges”. This document will serve as input for a policy-oriented document on the outcomes of the workshop, providing a overview of the challenges and opportunities identified and suggestions of what is required going forward on a policy level. After some group activities and discussions we produced a draft document that is being elaborated in the post-meeting phase. 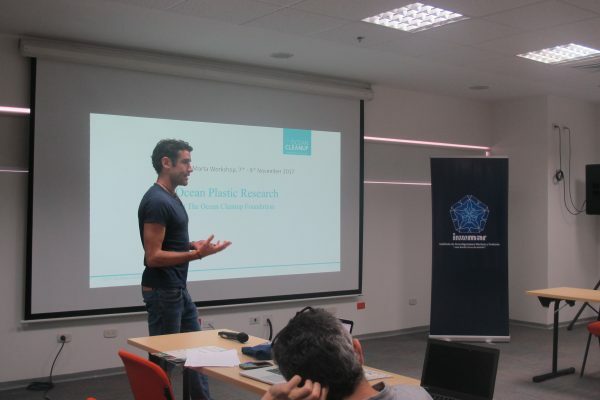 After the presentations we come out with two proposals (one about plastic debris in the Caribean and another one about coral bleaching) that are being discussed in the post-meeting phase. These two initiatives could be the seed for seldom funded projects. This workshop was a success for COOP+ since we discussed on several important topics in a very fruitful environment provided by our colleagues in INVEMAR. After the two days meeting we enjoyed a wonderful field trip in Tairona protected area. Session 1:Welcome by local authorities, introductions and overview of the workshop targets and technicalities. Session 2: Review of the Marine Global Challenges described by COOP+ project members (pico-presentations). World cafe to review gaps and main aspects of each Global Challenge. Session 3: Research Infrastructures’ quick overview: capabilities and perspectives regarding the Global Challenges and Research Infrastructures cooperation. Session 4: Parallel sessions to work on each Global Challenge description (review of the template, status of the writing process, challenge within the challenge). All relevant materials regarding Global Challenges descriptions will be distributed among participants prior to the workshop. Session 1: Parallel sessions to work on each Global Challenge description (continuation from previous session). Session 2: Planning for pilot project: discussion on how to prepare a pilot project to implement part of the topics discussed during the challenge description. Session 3: Policy-oriented document: development of table, report and recommendations to derive. Session 4: Tour around INVEMAR facilities. Wrap-up session, conclusions and closing. 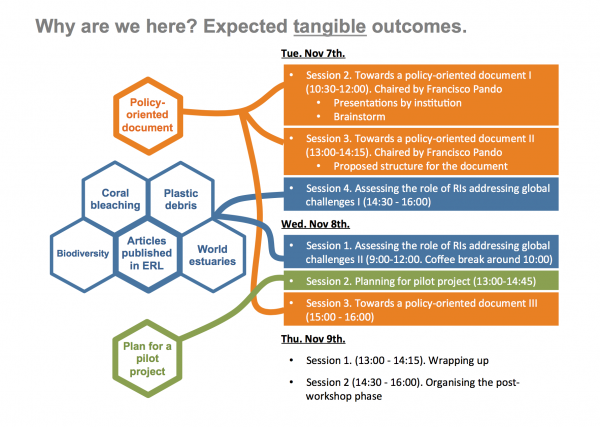 I am concerned that this workshop is being held at the same time as ENVRIweek, which will involve many European RI’s.